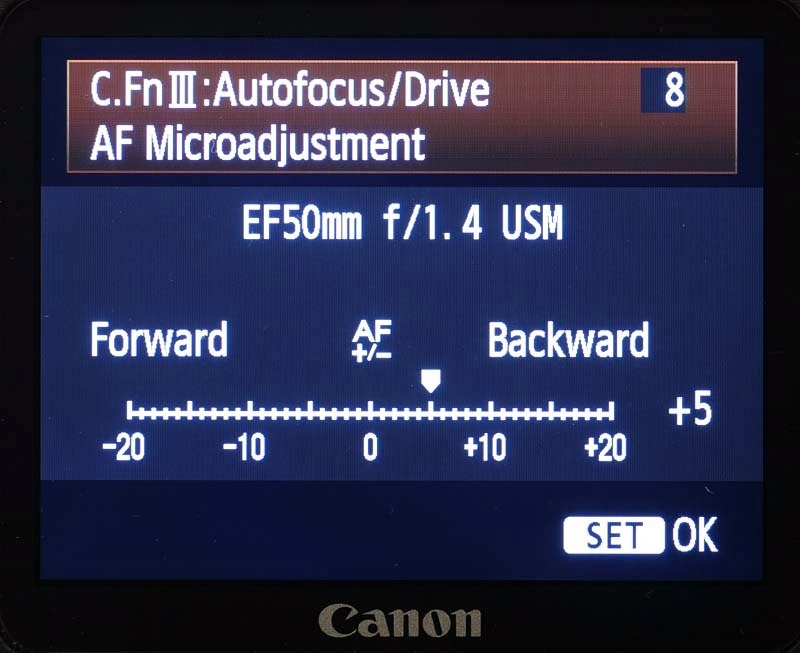 AF Microadjustment is a feature seen in most recent mid-range and high-end Canon EOS digital SLRs. Introduced in 2007, it allows the photographer to shift the camera's plane of sharpest focus if he or she feels that the camera is consistently putting focus in front of or behind the intended subject. For example, if a photographer felt the camera was "back-focusing" - that is, putting the sharpest plane of focus consistently behind their actual subject - AF Microadjustment allows in-camera adjustment to move the sharpest plane of focus forward so that it's closer toward the camera. While focus precision with any EOS camera is extremely high, AF Microadjustment is a tremendous leap forward in fine camera control for the critical photographer. We'll explore how to best utilize it in this document. What does AF Microadjustment do? It allows the user to command the camera to intentionally shift the sharpest focus either in front of or behind where it's factory-set. The extremely precise AF system in a digital SLR is designed to read contrast at the subject, calculate how to drive the lens to focus sharply on the subject, and confirm sharp focus once the lens has stopped. With AF Microadjustment, the user is changing the data coming from the AF system, and asking it to move the lens farther in one direction or the other whenever it has to read and calculate sharp focus. The adjustments applied using this control are based on the depth-of-field you'd have at a lens's maximum aperture. They are not based on the lens's focal length! When setting the Microadjustment, you'll see a scale on the camera's LCD monitor with up to + or - twenty steps. Each step is a very fine increment, equal to 1/8th of the depth-of-field you'd have with the current lens wide-open. And that 1/8th of the depth of field is only moving forward (toward the camera) or back (toward the background) from the sharpest plane of focus. The main thing to remember here is that these are very fine increments. Don't expect radical shifts in focus with adjustments like plus 3 or minus 5. First step: closely examine real-world images you shoot - ideally, stationary subjects using One-Shot AF mode (more on this in a moment). If most of your images are sharp and only once in a while you see a slight focus shift, STOP. AF Microadjustment will shift focus for each and every picture you take, and you probably don't need it if the AF system is generally producing sharp images, with focus where you expect it to be. On the other hand, if there's a consistent tendency for the sharpest part of the picture to be either in front of or behind the subject, read on. Take a series of test shots. We'll detail these in a moment, but the key is taking test shots where you can recognize focus as it shifts forward or backward from your intended subject. Once you settle on an adjustment, shoot and examine more real-world subjects on your computer screen. AF Microadjustment is a trial-and-error procedure, so it may take a few cycles of adjust > test > evaluate to find your sweet spot. 1. Adjust all by same amount: If you find that upon close inspection, no matter what lens you use, the camera tends to put sharpest focus in front of or behind where you need it to be (not just once in a while, but on a consistent basis), this is the setting to use. Once set, the camera will intentionally move the sharpest plane of focus either forward, toward the camera, or backward (more toward the background). 2. Adjust by lens: This is the setting to use if you find, when looking closely, that pictures taken with one lens seem to consistently be front- or back-focused, but images taken with other lenses on the same camera seem fine. Mount the lens(es) you feel are not working properly with the camera, and take test shots as described below. Up to 20 different lenses can have an adjustment applied for that specific lens model, memorized by the camera, and the camera will automatically apply your adjustments as soon as you attach that particular model of lens. You'll even see the values appear within the camera's AF Microadjustment Custom Function menu screen whenever a lens you've applied an adjustment to is mounted. • The camera can distinguish between different models of Canon EF lenses, but it cannot read serial numbers and distinguish between two samples of the exact same lens. 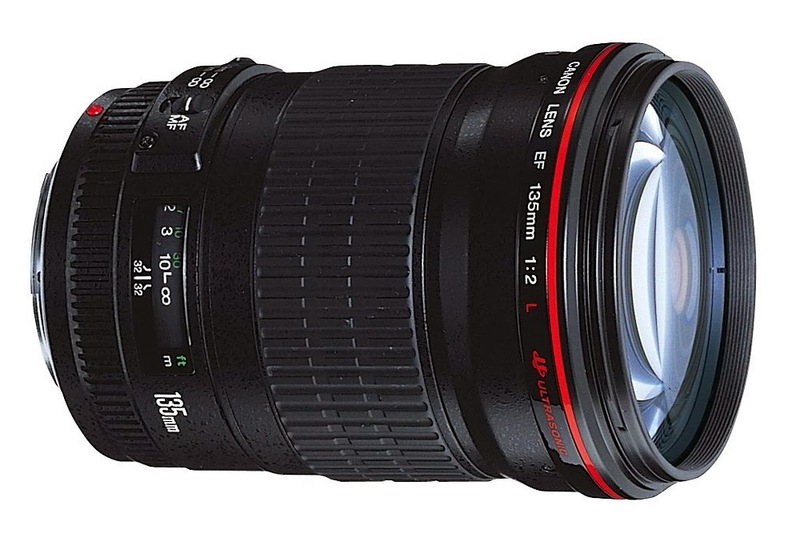 In other words, it can tell if you have the 70-200mm f/2.8L or 70-200mm f/2.8L IS II lens attached. 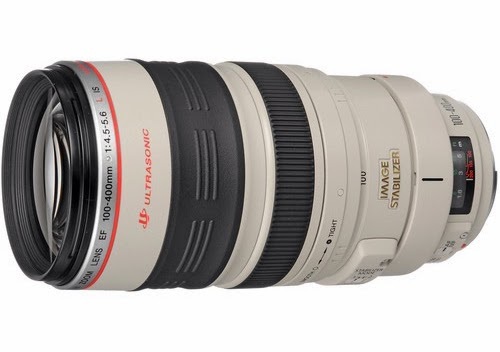 However, it cannot distinguish one 70-200mm f/2.8L IS II lens from another. • The camera recognizes an EF lens with a Canon EF tele extender attached as a separate lens. So you could, for example, have one adjustment for your 300mm f/2.8L IS lens, and another focus adjustment for your 300mm f/2.8L IS with the Canon EF 1.4x II tele extender attached. The camera would automatically apply whichever one is needed, based on whether that lens is being used with or without an extender. • Operational reliability is guaranteed with Canon EF lenses only. While users are free to try the procedure with third-party lenses, there's no assurance of proper interaction between body and lens. A third-party lens can also be mistaken for a Canon EF lens, if the latter is subsequently attached. • Even if you perform the Adjust by Lens procedure, if you attach a different sample of the exact same lens model (example: a newspaper shooter owns a particular lens, but borrows the same model lens from his or her paper's loaner equipment for an event), the AF Microadjustment can be temporarily turned off (but held in memory) by simply selecting "Disable". You can re-apply your settings later when you attach the exact lens you made the adjustments for by re-selecting "Adjust by Lens" within C.Fn III-7. • You can always take more test shots in the future, and change any previous AF Microadjustment for a specific lens model. In this case, the previous adjustment amount for that particular lens is cleared completely from the camera's memory. • Any AF Microadjustments you apply always stay within the camera body, not with the lens. So if you make adjustments for one particular lens in an EOS 7D, there is no change in the lens's characteristics if that lens is subsequently mounted on (for example) an EOS 5D, or even another EOS 7D body. If you have more than one Canon EOS body which allows AF Microadjustment, you should evaluate each body separately, and not immediately conclude AF Microadjustment values from one body will automatically be what's needed for another. The basic procedure: you take a test shot with Microadjustment intentionally shifted, examine it closely on your computer monitor, and repeat until you find an adjustment value that provides the best results. There's no way to tell by just looking at the camera's menu which of the settings on the +20 to -20 scale will work best, without shooting controlled test pictures and evaluating them. Two keys to getting maximum use out of this feature - proper evaluation of actual image files you've shot with no adjustment applied, and proper test procedures in calculating the amount of AF Microadjustment needed. We strongly urge new EOS camera owners not to start manipulating this feature the moment they first take the camera out of the box. Like changing the ignition timing on your car, it's best to leave the factory settings alone unless and until you find a distinct need to shift them. Shoot full-resolution images as you normally would: RAW or JPEG, of real-life subjects - not on-line test charts. Examine those images on your computer screen at 100% view, and carefully ask yourself if you're consistently seeing soft images - but images with *something* else in the picture, even if it's grass or pavement behind your subject, that's tack-sharp. If this is happening most or all of the time, you may be a candidate for AF Microadjustment. Remember : for AF Microadjustment to work, there has to be some issue with your AF system's ability to render the intended plane of sharpest focus truly sharp. Whether you use AF or focus manually, sharp focus can only be in one of three places: either right on your intended subject, in front of that subject, or behind it. In other words, if focus is the problem, something in the picture usually looks tack-sharp. Here's the point: if you're seeing images where *nothing* looks critically sharp, you probably need to examine other possible issues. This includes camera or subject movement from too slow a shutter speed, the amount of electronic sharpening being applied to your files, Picture Style settings if you're shooting JPEG images, and so on. AF Microadjustment cannot account for these problems. Don't let the scale you see on the AF Microadjustment screen confuse you. The "plus" settings add distance, and are labeled Backward on the scale you see within the camera's Custom Function menu. With "plus" settings, you're telling the camera to shift focus to a plane farther away from where it normally does. Set this way, the camera will tend to focus a bit more toward the background. This would be the direction to choose if the camera tends to continually focus in front of your intended subject(s). The "minus" settings are labeled Forward on the scale within the AF Microadjustment scale. This moves the plane of focus closer to the camera. If your camera consistently seems to put focus behind your intended subject, start your test shots with settings on the Minus side of the scale. It's called "minus" because you're subtracting a bit from the distance the camera would normally put its sharpest focus upon. Canon suggests using the procedures below to perform test shots, to see which of the AF Microadjustment settings is best for you. Always remember: you can return to the factory default AF settings in two ways, either by setting AF Microadjustment Custom Function back to option "zero" (this doesn't clear any of your Microadjustments from memory, it just ignores them until you re-activate the "Adjust all by same amount" or "Adjust by lens" options on the C.Fn menu), or alternatively by going into one of these AF Microadjustments, and dialing your setting back to zero on the +/- 20 step scale. This last action will clear your previous settings from the camera's memory. • Shoot test pictures using the lens(es) you normally use, and at the distances you typically use them. In other words, if you're seeing a consistent focus shift when you shoot group pictures at weddings, don't take test shots of a ruler on your desk with a macro lens. • Use Av mode, and always shoot the test shots with the lens aperture wide-open - regardless of whether you normally stop the aperture down or not. You'll be much better able to see any subtle focus changes wide-open, than with the lens stopped down. • If you're using a zoom lens, zoom to its maximum telephoto focal length for test pictures. AF Microadjustment can only apply one correction to a zoom lens, so you cannot have one adjustment for the lens's wide-angle setting and another one for the same lens when it's zoomed to telephoto. •Even if you're a full-time sports shooter, do not use AI Servo AF mode for these test shots. Shoot a completely stationary subject, with the camera set to One-Shot AF. There are far too many other variables involved in focus-tracking with AI Servo AF to get conclusive results for AF Microadjustment taking test shots this way. •If at all possible, use a tripod to keep the camera absolutely positioned on one part of your intended subject, and also eliminate any potential camera movement from entering the mix. •Manually select only the Center AF point (regardless of whether this is how you typically use the camera), and be certain that any AF point expansion is completely disabled. Do not, under any circumstances, use Automatic AF point selection mode - this can definitely lead to unpredictable results. •Be sure the center AF point is solidly upon part of your subject with sufficient detail, and that there's adequate detail in front of and behind your target to assess whether focus is indeed occurring in front of or behind what the center AF point is seeing. Since the values for each step on the AF Microadjustment scale are so fine (again, only 1/8th of the forward or backward depth-of-field! ), it's best to start your test shots with major adjustments like plus or minus 20, and then work your way back to finer values if necessary. If you feel your camera focuses behind where it should, for example, you might take two initial test shots at minus 20 and minus 10, and see how your test subject appears when closely examined. If you start with very fine increments (such as plus 3 or plus 5, for example), the changes may be so subtle that you'll have trouble detecting them. When you get test shots that seem to place the focus dead-on, note the adjustment value in place and be sure the camera is set there on the +/- 20-step scale. AF Microadjustment is complete. Go out and shoot some real subjects! This terrific Canon feature will surely be a benefit to very critical users, whose only option if they encountered a tendency for focus error in the past was to send equipment to a service technician for evaluation and adjustment. 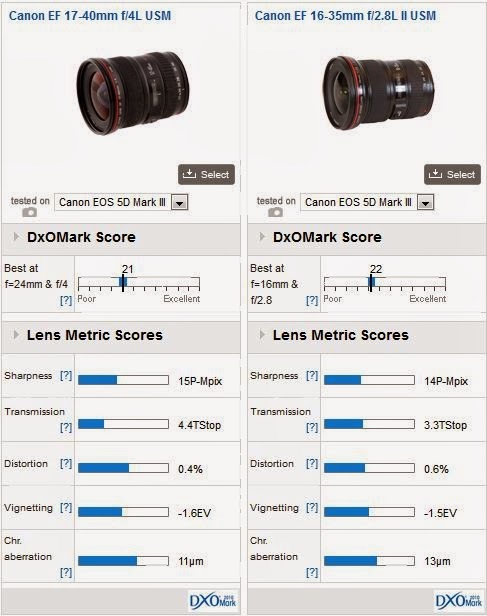 Especially since AF Microadjustment can be performed for individual lenses if needed, it's a great step forward in allowing users to fine-tune their cameras to their exact needs. But remember : AF Microadjustment isn't a cure-all for any and all images that simply don't look sharp. It can only cope with shifting your plane of sharpest focus closer to or farther from the camera. And of course, it works within a specific range - if you need even greater range of AF shifting for proper sharp focus, you'll probably have to have your equipment examined by a service technician. However, used appropriately, it's a feature that opens a new range of possibilities for the working pro photographer or serious, dedicated amateur. London, UK, 29 January 2014 – Canon is continuing its support for budding filmmakers with the second year of its partnership with Berlinale Talents – a creative networking event for emerging film industry talent that is part of the Berlin International Film Festival. As Principal Partner of Berlinale Talents, Canon will present a number of master classes for over 300 promising talents in the film industry, featuring world-class workshops with cinematographers and the latest Canon equipment. Taking place from February 8th-13th 2014, a series of workshops presented in partnership with Canon will offer filmmakers and industry professionals invaluable hints and tips that will help them tell their own stories. The workshops – entitled ‘Every Picture Tells a Story’ – will also provide insight into the latest developments in camera technology, with hands-on demonstrations that show how Canon products can assist production. Speakers involved in the workshops this year include distinguished cinematographers Franz Lustig (How I Live Now), Stefan Ciupek (Slumdog Millionaire), and Christopher Doyle (In The Mood For Love). For the first time, Canon will also commission a selection of short films from the Talents, to be shot on Canon’s products. The short films will be showcased by Canon, both at industry events throughout Europe and on theCanon Professional Network. 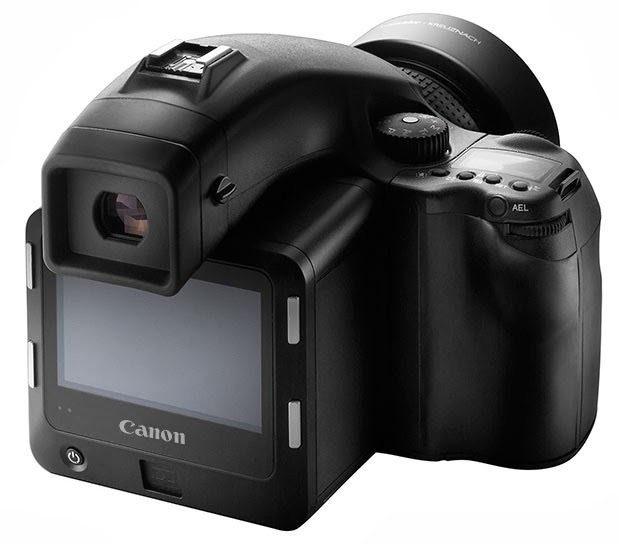 Canon EOS-7D Mk II camera coming? The 2014 Winter Olympics is just round the corner. This is an excellent platform for camera manufacurers to try out their latest equipment. Nikon will have their soon to be released D4s camera there. Canon is obviously not being left behind and will have plenty of their latest gear there for testing and demonstrations for their 'special' guests. All of the photographers testing the prototype equipment will be bound by Non Disclosure Agreements (NDA) and I expect very little leaks coming from the event. 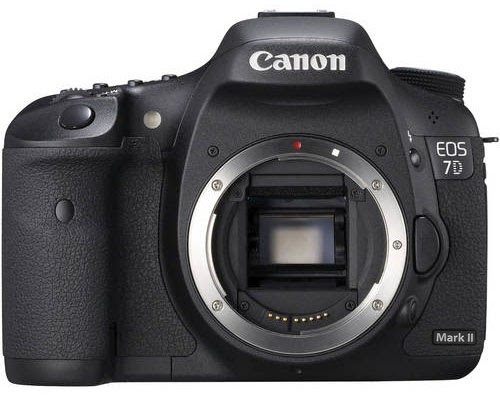 One of my most anticipated cameras from Canon is the EOS-7D Mk II. The current 7D is an excellent piece of equipment and my pick, four years in a row as the best value in APS-C camera. With the Olympics and the CP+ show both occurring in February, Canon will loathe to see Nikon get all the limelight with 'sightings' of the D4s cameras dominating photography news and may raise their profile a bit during the sporting events. Canon has not decided to even call the replacement camera, EOS-7D Mk II, but they will have enough prototypes out there during these upcoming games to help them gain all the insights from field testing. There is an even chance Canon may announce the new camera in the second quarter with a delivery date for early third quarter. The features of the new camera has not been firmed up and the feedback from the Olympics are crucial in determining the final specifications. I am very fond of my EOS-7D camera and cannot wait to get the new model. With the EOS-1D Mk IV no longer in production, a semi-professional APS-C body is very appealing to me. Although overshadowed by its more glamorous sibling, as a moderately priced, highly portable ultra-wide zoom, the EF 17-40mm f/4L USM is a hugely popular model. Read on to find out how well it performs in our labs. After upgrading to Firmware 2.0.3, I have taken the camera on wildlife photo shoots to Maui and India. The camera works even better with the new software. What is new in Firmware Version 2.0.3? Autofocus : expanded range of Accel./Decel. Tracking settings to improve AI Servo AF stability when focus-tracking subjects moving at a consistent speed. AF point management : Orientation Linked AF adds a new option to register only AF points rather than AF point plus area; Auto AF point selection in AI Servo can now start from the same AF point used last during Manual AF point selection. The EOS-1D X already has arguably the most powerful AF system developed to date by Canon, but firmware version 2.0 is a crystal-clear indication that Canon engineers have not been resting on their laurels. Responding to feedback from some of the world’s most demanding professional shooters, this new firmware begins by modifying the AF control sequence so that AI Servo AF tracking during the initial stages of activation, and following the subject, is even more responsive and positive in low-light situations. This is one that requires no input from the photographer, once he or she has set the EOS-1D X for AI Servo AF. The change occurs within the camera as soon as AF is activated and begins to follow a subject. By itself, this change in AF means that the start of focus-tracking, and the first shot taken, are more likely to be accurate in low-light conditions. But what if you shoot a series of consecutive shots, with continuous advance? Until now, the EOS-1D X has offered one menu setting for each of these. There’s also a standard setting that provides a balance between the two during continuous shooting while focus-tracking a moving subject with AI Servo AF. What does this bring to the photographer? For news shooters and others who may need to simply ensure the fastest possible shooting and greatest number of frames to select from, setting AI Servo 2nd image priority to the “-2” option adds even more consistency to frames-per-second shooting speed. Need the 12 fps that the EOS-1D X offers, no matter what? This new, expanded setting provides it. Picking up where the first item we mentioned in this article leaves off, if you choose the “Focus priority “+2” setting, you’re telling the AF system to allow extra time (if needed) during a high-speed sequence to ensure sharpest possible results for each frame. Low-light AF performance, in particular, is enhanced when the EOS-1D X is set to the “+2” setting, during AI Servo AF shooting. This falls under the “Accel./Decel. Tracking” setting, which can be accessed in the first AF Menu screen (press the PROTECT button, when in any of the six AF Case settings, to go into the detail settings on-screen). Once again, it’s important to understand the basics of what Accel./Decel. Tracking is really about. 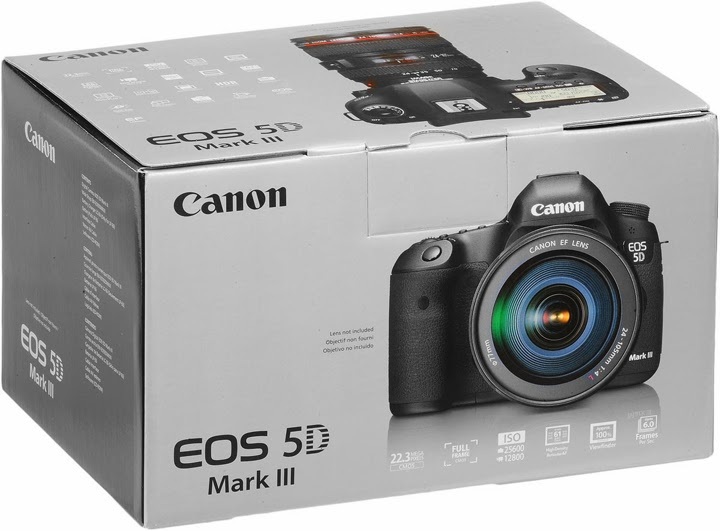 This feature, also present on the EOS 5D Mark III, EOS 6D and EOS 70D, is essentially unique in the digital SLR world, as of early 2014. 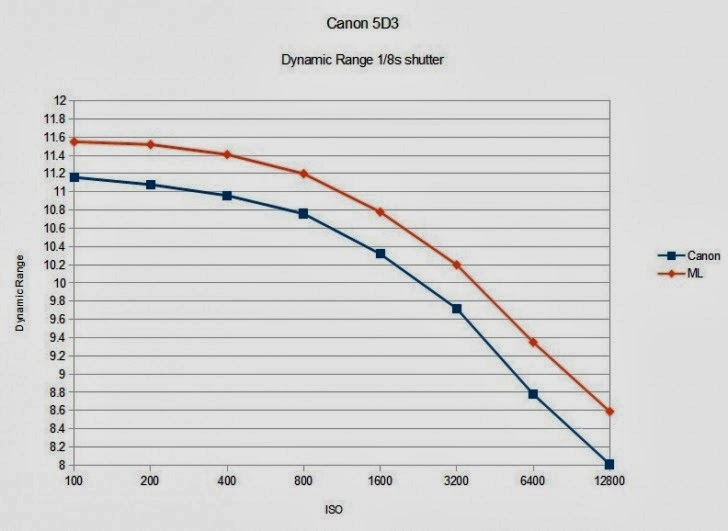 Until this was introduced on the EOS 5D Mark III and EOS-1D X, DSLR camera engineers developing a continuous autofocus system could optimize it for steady, continuous subject movement (think of anything from a jogger to an Formula One race car, moving straight at the camera with the photographer at the end of a long straightaway). Or, they could optimize AF for the rapid changes in subject movement that happen in sports, such as soccer or basketball, or that some wildlife might exhibit while darting around to gather food or evade a predator. The key is, until Canon developed Accel./Decel. Tracking, the AF system couldn’t be the master of both. That meant that once a camera with an AF system was introduced and when photographers found themselves in situations that the AF wasn’t optimized for, they simply had to make-do with less than optimum results. 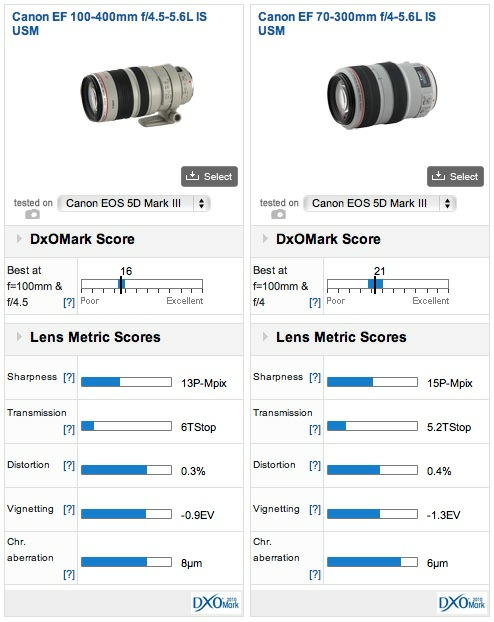 Zero : The normal default setting for “Case 1” in the EOS-1D X and EOS 5D Mark III and factory-default for the EOS 70D. This presumed a steadily moving subject, with only modest changes in speed likely. Focus-tracking in AI Servo AF is tailored to track this type of movement. One : AI Servo AF is now being told to expect possible changes in movement and speed, as you might find in many real-life sporting events. Two : Accel./Decel. Tracking is being told to anticipate significant changes in apparent subject speed – anything from the start-and-stop nature of basketball to tightly composed shots of a nearby sprinter, where the change in distance and subject size from frame-to-frame is most pronounced. New “-1” and “-2” settings in Accel./Decel. Tracking means an even less tendency for the AF system to lose an occasional frame, with subjects ranging from marathon runners to race cars, when the photographer is certain that the subject’s speed — and the shooter’s ability to keep the active AF point(s) steadily upon the subject — will remain continuous during shooting. Sometimes, continuous AI Servo AF is used even with subjects that don’t move much, like a speaker at a podium. With the two new “minus” settings, shooters have a way to tailor the EOS-1D X so that continuous AF is even better suited for subjects who may move slightly, but aren’t likely to move much. The two new “minus” settings for Accel./Decel. Tracking also stabilize AF if you’re focus-tracking a moving subject and there’s a sudden change in what the AF point sees because something near the subject suddenly interferes. What do we mean by this? Examples include a nearby athlete coming into the focus point area. Or, while in a tight shot of a sprinter, his or her hands come up in the running motion and appear in the area sampled for AF. Previously, if such a slight but sudden change to AF occurred, the camera could be thrown off and tries to refocus on this new object or flutter back and forth for a few frames. The “-1” and “-2” options now give critical shooters even more control when this might occur. An important note : Knowledgeable readers may read the last bullet point and be confused because these cameras also have a different AF setting called “Tracking Sensitivity,” which changes AI Servo AF’s reaction to sudden changes in what the active AF point sees. The difference is that Tracking Sensitivity is tuned to deal with how quickly the camera will react to sudden and major changes in what the camera sees (such as if a referee at a sporting event suddenly steps between the camera and subject or if a shooter is tracking a subject and is suddenly the AF point is now momentarily looking at the bleachers in the distance). The “-1” and “-2” settings for Accel./Decel. Tracking, on the other hand, adjusts the AF system’s sensitivity to sudden but minor changes in what the active AF point is seeing – that’s the difference. With this firmware update, Tracking Sensitivity on the EOS-1D X remains unchanged and is still an effective tool for wildlife, sports and other shooters to adjust how the camera reacts to major interferences or changes when focusing upon moving subjects. The 61-point AF system of the EOS-1D X has always offered a terrific array of options to change the size of a manually selected AF point and to move quickly from one part of the large AF area to another. And, of course, users can also have the camera automatically select the AF point, instead of manually choosing a location. Automatic AF point selection works in both One-Shot AF and AI Servo AF modes. One tremendous Canon feature that carried over with the very first EOS-1D X cameras is Orientation Linked AF. This AF Menu option (it’s not active, by default) lets the user manually register any AF area selection mode and AF point or zone location for horizontal shooting, then rotate the camera and register a different AF area selection mode and AF point or zone location that he or she might like for vertical shots. Now, during shooting, if the camera is simply rotated from horizontal to vertical (or vice-versa), it automatically changes the location of the active AF point and you see this right in the viewfinder. It’s always been possible to even select different AF Area types for the horizontal and vertical AF points chosen when Orientation Linked AF is active. In other words, if a user wanted a wide, expanded AF Area for his or her horizontal images and Spot AF for their verticals, all they have to do is set this when initially navigating to the respective horizontal or vertical AF points with Orientation Linked AF active in the AF Menu. Orientation Linked AF is off. If you manually choose an AF point with the camera held either horizontally or vertically, the same point is used for the other orientation. There’s no change here with the new firmware upgrade in the EOS-1D X.
Orientation Linked AF is active. Same operation as previously – separate AF Area types can be set for the two different points; if one is changed, the other remains as it was before. Orientation Linked AF is active. Separate AF Area types can be set for the two different AF points. What’s new is that if one AF Area type is changed by the user, the other changes as well. The way to remember this in the AF Menu is that in the item directly above, you separate both Area type and AF point location; in this new entry, you separate the point location only. This new option applies only when Automatic AF point selection is used with AI Servo AF. The 61-point AF system in the EOS-1D X has always required users to select one AF point as a starting area for Automatic AF point select mode, if set to AI Servo AF (most previous EOS cameras simply required the user to always begin focus-tracking with the center AF point). Same operation as previously: when in AI Servo AF and the user moves to Automatic AF point select mode, he or she must manually dial-in a starting point — AF will begin at that point. If the subject then moves away from that point, the system will use other points within the 61-point array (selecting them automatically) to keep the subject in focus. The starting point set by the photographer is completely independent of the last point used during Manual AF point selection. The same AF point last used during Manual AF point selection is used as a starting point when AF Area mode is set to Automatic AF point selection. This means a user can be working with his or her manually selected AF point (center or any off-center AF point) and if they decide to switch to Automatic AF point selection, they initially start focus-tracking with the same point that they were using. Auto ISO has become an increasingly relied-upon feature for numerous advanced DSLR users. If used in Av or Tv exposure modes, it allows the camera to adjust ISO as lighting in a scene changes, while maintaining fairly consistent apertures and shutter speeds. And, if used in Manual exposure mode, serious shooters have quickly discovered it’s an important ally in maintaining precisely the same shutter speeds and apertures, while allowing users to freely shoot even in changing lighting conditions. The “minimum shutter speed” menu setting for Auto ISO tells the camera that at any given ISO setting (in the P and Av exposure modes) that if lighting drops and causes shutter speed to drop below a user-defined level, to begin raising ISO automatically to preserve at least that shutter speed. This is intended primarily to ensure safe shutter speeds for hand-holding and so on. Until now, the range of speeds topped out at 1/250th of a second – sufficiently fast for many uses, but still potentially problematic with long lenses or particularly if shooting moving subjects. When the EOS-1D X has firmware version 2.0 installed, the Minimum Shutter Speed menu will have an expanded range of choices, up to and including 1/8000th of a second. In other words, as long as the lighting in a scene is sufficiently bright that Auto ISO doesn’t need to exceed the user-set Maximum ISO level (that’s a separate setting, unaffected by this firmware upgrade), the camera can be set to ensure fast shutter speeds. This is another direct response to user feedback. If a user has locked in his or her choice of shutter speed and lens aperture in the Manual exposure mode and wants to keep these settings, Auto ISO has become a viable way to do this in the face of changing lighting. Same speed, same aperture and the camera can adjust ISO to compensate as scene lighting changes. But until now, there’s been one problem: no way to intentionally lighten or darken the image. Auto ISO in Manual exposure mode has sought to simply provide one “proper” exposure level. If you change the shutter speed or aperture with Auto ISO, the only response is a newly adjusted ISO to compensate and continue to provide this camera-defined “normal” exposure level. Press “Q” button, highlight Exposure Compensation on Quick Control Menu (on rear LCD monitor) and turn Quick Control Dial. ± Compensation appears on the menu screen’s analog scale. Via Custom Controls menu, assign SET button for Exposure Compensation when pressed. To do this, press SET button, hold it in and turn top Main Dial to apply compensation. In either case, when Exposure Compensation is applied with Auto ISO and the camera in Manual exposure mode, ISO is further adjusted to apply the compensation that’s dialed-in by the user. The user-set shutter speed and aperture remain constant. It’s happened to many of us: you’re using a lens like the EF 70–200mm f/2.8L USM with aperture wide open in the Manual exposure mode and then stop and attach a 1.4x or 2x tele extender to the lens. You know the lens’ effective maximum aperture drop one or two stops (with the EF 70–200mm f/2.8L USM lens, for example, adding the 1.4x extender means wide open shooting now happens at f/4). In your haste, you immediately begin shooting, only later to realize that since the lens slowed a stop or two, you didn’t compensate your Manual exposure by adjusting your shutter speed or ISO. You’re one or two stops underexposed. No exposure correction when shooting in Manual exposure mode, if maximum or minimum aperture of a lens changes. This is how EOS cameras have functioned up to this point and it remains the default setting once firmware version 2.0 is installed in an EOS-1D X. If you were working at one group of Manual exposure settings at the maximum (or minimum) aperture of a lens changes and you begin shooting again, the camera will step in and adjust ISO to maintain a constant level of exposure. The shutter speed you set previously would remain constant. In Manual exposure mode, if the camera detects a change in the lens’ maximum or minimum aperture and you’re set there, it will step in and vary shutter speed so that exposure level remains where it was for the last shot you took. Again, if you were shooting wide open without an extender and then added the 1.4x or 2x extender, the camera will step in and reduce your manually set shutter speed as soon as you start shooting — so that your final exposures remain the same. The rear AF-ON and AE Lock buttons are a hallmark of custom operations in the EOS system and photographers have been using “back button AF” for more than two decades. The EOS-1D X has always allowed shooters the option of not only activating AF via one of these back buttons, but also (if the user desires) to instantly activate a different memorized AF point for that AF. Same as in previous versions of the EOS-1D X. The back button AF is active and by pressing the INFO button, the user can also opt to have the camera use the existing AF point or a jump immediately to a “registered” (memorized) AF point (via the “HP” — Home Position — icon on the menu screen). Select an entirely different AF “case,” via the same AF Configuration Tool options that are in the AF menu. What this does is let the user tailor one back button for a completely different type of AF operation. The other back button could be used for the action they anticipate will normally occur. In other words, you can have two different types of AF operations, literally at your thumb. This is especially exciting when you consider the new AI Servo AF features that this new firmware brings to the EOS-1D X.
Dedicate one of the two back buttons to either One-Shot AF or AI Servo AF. A shooter working an event that normally calls for One-Shot AF, for instance, can instantly switch over to AI Servo just by pressing a back button they’ve dedicated for that purpose. Or, of course, you can “maintain current setting” so there’s no change in AF mode. Instantly switch from the normal maximum of 12 fps, high-speed operation to the EOS 1D X’s special 14 fps, Super High Speed continuous setting by pressing either the AF-ON or AEL buttons. AI Servo AF won’t function during 14 fps shooting, but by assigning this to a back button, you can auto focus and shoot at 12 fps via the shutter button, and then instantly have access to the 14 fps operation by pressing the back button; AF will lock upon the spot where 14 fps started. Two prerequisites for this to operate are : 14 fps continuous drive has to be “enabled” (Custom Functions Menu #3 > Restrict Drive Modes > put check mark at 14 fps icon) and the camera must be set to shoot JPEG images (14 fps Super High Speed operation isn’t possible if the camera is set to shoot RAW files). In addition, 14 fps operation won’t kick in unless the camera has already been set to Continuous-High operation. Previously available only as a Custom Control with buttons like the depth-of-field preview button, firmware version 2.0 now allows the EOS-1D X to use either of the “back buttons” to instantly toggle between One-Shot AF and AI Servo AF. No matter which AF setting you’re on, press the appropriate back button and the AF instantly switches to the other while you have your thumb on that back button. This is slightly different than the option to change AF mode mentioned above. Within the Metering/AF options (described above), it’s possible to have multiple combinations of these settings applied to a single back button. Selecting the One Shot AF/AI Servo AF icon within the Custom Controls for either back button simply dedicates it to toggle between the two AF settings. This is an addition to the JUMP options during image playback on the camera’s LCD monitor. Press the Playback button, then turn the top Main Dial and only images you’ve previously protected will play back. This can be useful for those who use the “Protect” function (to prevent accidental erasing of images). It’s now possible to show a client only those files you’ve protected, avoiding outtakes and other images you perhaps don’t want to show. This is in addition to the “RATE” function; many shooters will find the Protect function is arguably faster to apply during breaks while on-location. 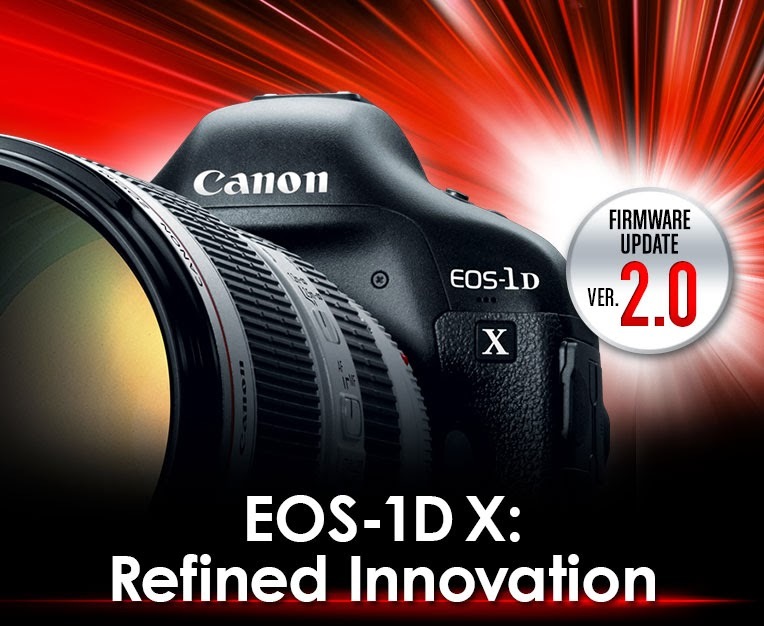 Firmware version 2.0 for the EOS-1D X is a comprehensive update, taking what’s already Canon’s most powerful and advanced professional-grade camera and adding features, options and low-light AF performance. Its abilities to let users make instant changes to operation, without having to remove their eye from the viewfinder, is a revelation in certain shooting conditions. Added control over how the AF system performs, especially adding stability with subjects moving at steady speeds, will be welcome for many wildlife, sports, fashion and event shooters. Auto ISO has suddenly become a viable option for many professional users, now that overall exposure can be lightened or darkened even in Manual mode, and that minimum speeds can be set up to 1/8000th of a second. Settings to speed up AF point management, and make on-the-fly switching from manual AF point selection to Automatic AF point selection even faster, once again speaks to making day-to-day operation with this camera even smoother and faster. 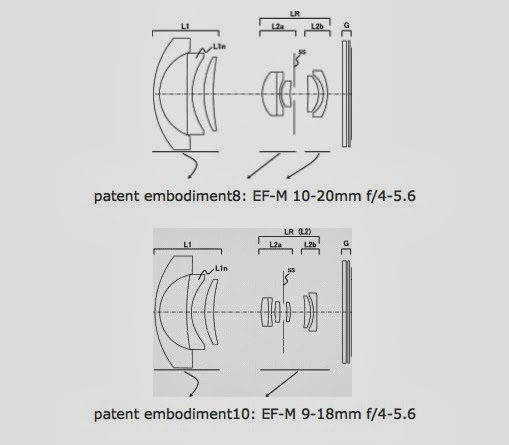 Egami, the Japanese Blog has uncovered a Canon patent for a 11-24mm f/4 lens design. Currently, they do not have a lens in this focal range. Nikon has their 14-24mm f/2.8 lens and other third party lenses are also available. Personally, I have little use for such a lens. 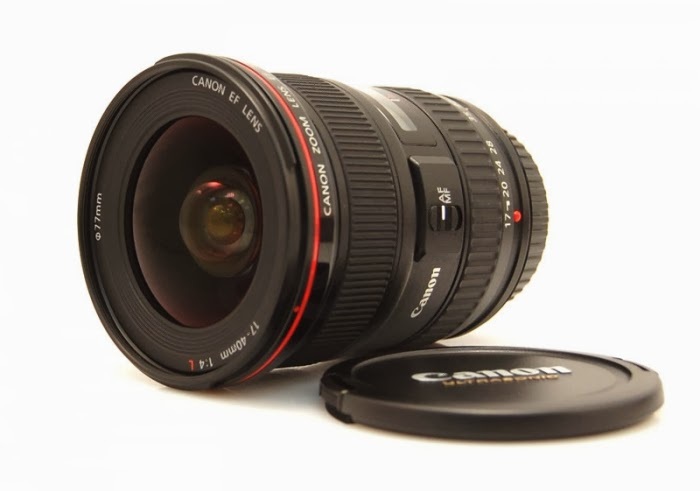 The closest model I own are the Canon EF 16-35mm f/2.8L II and the EF 8-15mm f/4L Fisheye. The Canon Digital Learning Center has published a new batch of white papers on their EOS Cinema system. Click on the links below to download the documents in PDF format. 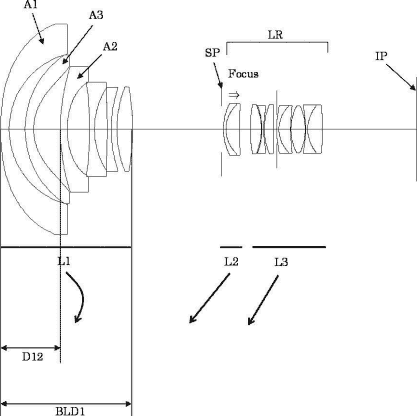 The newer generation of Cinema EOS lenses came from multiple optical design resources within Canon, such as ourEF Lens and Broadcast Lens designs. A design goal with the Cinema zoom lenses was to achieve an overall optical performance that would equate with the best of contemporary prime lenses over their respective focal lengths. Achieving a high contrast ratio is universally sought by cinematographers and is always a central design goal for the optical designers. Canon-Log is designed to reproduce the entire tonal reproduction range of which the new CMOS image sensor used in the EOS C300 (and future EOS C500 cameras) is capable. This paper will discuss an optoelectronic transfer characteristic developed by Canon that ensures effective management of wide dynamic range HD imagery. Canon's EOS C300 has a totally new CMOS imaging sensor, dedicated to outstanding video image quality. This White Paper takes an extremely detailed look at the technologies that make this happen. A highly technical White Paper, examining the RGB video characteristics of the EOS C300 camera, for both progressive and interlaced video formats. The Golden Gate Bridge is one of the seven wonders of the modern world, in my book. The bridge is 8,980 feet in length and the longest span is 4,200 feet. The elevation and height are 220 and 746 feet respectively. The Golden Gate Strait is the entrance to the San Francisco Bay from the Pacific Ocean. The strait is approximately three miles long by one-mile wide with currents ranging from 4.5 to 7.5 knots. It is generally accepted that the strait was named "Chrysopylae", or Golden Gate, by John C. Fremont, Captain, topographical Engineers of the U.S. Army circa 1846. It reminded him of a harbor in Istanbul named Chrysoceras or Golden Horn. It took a little over four years to build the Bridge. Construction commenced on January 5, 1933 and the Bridge was open to vehicular traffic on May 28, 1937. The dream of spanning the Golden Gate Strait had been around for well over a century before the Golden Gate Bridge opened to traffic on May 28, 1937. Pedestrian Day was held on May 27, 1937. I fell in love with the Golden Gate Bridge as a child and never grew tired of its beauty and timelessness. The bridge has the ability to present itself from many angles and time of day to give a totally new perspective every time. The next closest man made structure with this photogenic quality is the Taj Mahal in Agra, India. Visit my website MichaelDanielHo.com to see many more Travel images from around the world. 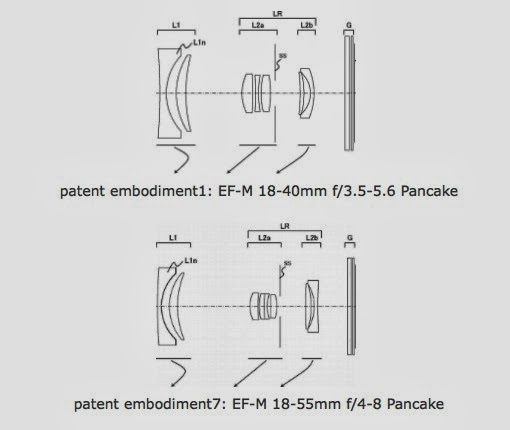 The Japanese Photography blog, Egami discovered a new patent filed by Canon that may be for new pancake lenses on the EOS-M system : 18-40mm f/3.5-5.6, 18-55mm f/4-8, 10-20mm f/4-5.6, and 9-18mm f/4-5.6. Feeding whole, front focus, focusing, rear focusing, etc. Canon is celebrating a a coup when Nikon shooter Scott Kelby switched over to Canon about 6 months ago. He is now using the EOS-1D X and EOS 5D Mark III cameras for the reasons of ergonomics, menu system and skin tones. In the above video, Kelby sits down with Canon Explorer of Light, Rick Sammon to discuss his switch. Canon is making too much out of one person's decision but I have picked the EOS-1D X as the best full frame DSLR two years in a row and the EOS-5D Mk III as the best value in full frame DSLR as well.